Fast action is a particular weakness for many TVs in the marketplace. There have been many feature enhancements to LCD TVs to try to make up for deficiencies which cause motion lag or blur and judder (a jerky effect during side to side panning). LED back lighting has helped the cause and is a technology specifically employed to attempt to remedy some of these issues. Historically, we favored plasma TV technology over LCD or LED when it comes to response rate (speed of processing), viewing angles, and black levels – all elements that will be very important when viewing football, tennis or baseball. However, OLED now takes the top crown as the best Sports viewing technology due to perfect side viewing angles, no problems with motion blur, and nearly perfect contrast. Our list below for best sports TVs is chosen based on 1) Great viewing angles without contrast loss – when you've got the guys over watching the game you do not want contrast to degrade and black levels begin to look washed out at angles. 2) No Motion Lag, blur and minimal judder – judder is that annoying jerky effect when the object or person moves side to side across the screen. It should be smooth. Motion lag or blur are produced when the processing in the TV are slower than the object moving on the screen causing some delay. 3) High Contrast and Deep black levels – these two go hand in hand but you certainly don't want the picture to appear washed out. Good contrast and deep black levels prevents that. All of these models are available in different sizes, check the manufacturer's main page for more. Up-scaling and conversion is the most important aspect of any 4K UHD TV for 2018/2019 due to the dearth of 4K content of the average viewer, and Sony is the best at it in my view. The reasons are the excellent combination of the 4K X-Reality PRO up-scaling Algorithm technology used with the new 4K Processor X1 Extreme engine. This is an excellent TV for sports viewing. No motion blur and no refresh rate concerns meaning excellent processing of fast motion. Another good Sony choice, this one is an LED backlit Quantum Dot TV, and although not perfect does a great job with those fast motion sports images with a 120Hz native refresh rate. The X00F has it all in terms of picture features, Extended Dynamic Range Pro, X1 4K Processor, and X-Reality Pro up-scaling algorithm, and widened color gamut (for HDR) Triluminous Display technology. All this combines for a fantastic picture. This is your economy choice but also offers the curved screen appeal. Motion blur from sports is actually negligible if non-existent. The curved screen can make the sports more involving. TCL has some nice technology built into this budget model like full array backlighting at a great price. With 1080p or HD sources it will do a good job. We must include the least expensive OLED TVs in this lineup. Though still pricey, they have excellent picture characteristics, great black levels and the processing is much improved. Nothing can match OLED technology for contrast, side angle viewing, and black levels. The other little known advantage is that there is no panel refresh rate issues causing motion blur like there is with LCD TVs backlit with LEDs. This is also the most economical (lowest price) of the OLED TVs! We feel the same about any of the LG OLEDs in terms of sports viewing quality. Up-scaling and conversion is the most important aspect of any 4K UHD TV for 2017/2018 due to the dearth of 4K content of the average viewer, and Sony is the best at it in my view. The reasons are the excellent combination of the 4K X-Reality PRO up-scaling Algorithm technology used with the new 4K Processor X1 Extreme engine. This is an excellent TV for sports viewing. No motion blur. Another good Sony choice, this one is an LED backlit Quantum Dot TV, and although not perfect does a great job with those fast motion sports images. The X930E has it all in terms of picture features, Extended Dynamic Range Pro, X1 4K Processor, and X-Reality Pro up-scaling algorithm, and widened color gamut (for HDR) Triluminous Display technology. All this combines for a fantastic picture. This is your economy choice but also offers the curved screen appeal. Motion blur from sports is actually negligible if non-existent. TCL has some nice technology built into this budget model. With 1080p or HD sources it will do a good job. Nothing can match OLED technology for contrast, side angle viewing, and black levels. The other little known advantage is that there is no panel refresh rate issues causing motion blur like there is with LCD TVs backlit with LEDs. While this model is not as aesthetically stunning, it has the same picture benefits for sports programming as the E6P. This is the macdaddy model for those that want it all. It comes in 65” and 75” sizes with 40w of sound output from the speakers. This top LED 4K model from Sony has excellent processing to upconvert 1080p signals to 4K resolution. How does the Sony X930C compare with an LG 4K OLED TV? We love OLED technology, so for a 4K UHD signal we give the edge to the LG OLED. But we believe Sony has the best processing and outer panel of the 4K TVs, so for 1080p and lower signals we believe this TV outperforms the LG 4K OLED. Comes in 55” and 65” sizes at quite a discount to the OLED TVs above. I have to include one of my favorite value models. Great light flow will make the KS8000 your ideal choice for very light rooms. Though there are inherent weaknesses with Edge-Lit LED lighting, Samsung has maybe the brightest LEDs in the market. The 8-Series passed the test on the new UHD Alliance brightness standard of at least 1000 nits. Comes in 55” and 65” models and also in the curved screen KS8500. This is another good value option with excellent side angle viewing due to its use of an IPS (in plane switching) panel. It makes for a good bright sports TV with lots of friends sitting a various angles. Comes in sizes 55”, 65”, 70”, and 75” making it about the largest option as well. The price is very right. Without going overboard with the very highest end features you get the ones you will appreciate most. These include UHD Picture Dimming, a 120Hz panel and 240 Motion Rate to help with fast motion sports, a quad core processor, contrast enhancer technology, precision black and peak illuminator picture quality adjustments – all for a great price. We are impressed by the upscaling of cable, DirecTV and broadcast signals to 4K resolution. Since this will be your primary sporting programming providers, that makes this a very compelling value choice for sports. You get full array local dimming to help with contrast. The top end Sony TVs still have the best upscaling to 4K and your sporting event picture will look almost 3­dimensional if you are pumping in 1080p HD signals. The 65X930C has the same top picture quality but with side mounting speakers if you want upgraded sound without having to purchase a nice sound system. These two have a motion rate of 960 from a 120Hz panel and full array backlight manipulation. Another great value choice, the price is right on this 4K 70” unit from Sharp. Side angle viewing is not the best, but the 4K revolution upscaler does a very nice job from the 120Hz panel for fast moving sports. The price is still very good at only $2000. One of the greatest characteristics of the picture performance of the VT60 series TV once calibrated is the exceptional deep rich black levels produced by the Infinite Black Ultra Panel. The VT60 has one of the nicest presentations of 3D material on the market for 2013. The TC-P65ST60 is the largest entry in the ST60 series. It falls in right in the middle of the 2013/14 lineup, though the picture quality and feature set are far from middle of the road. The picture quality is very similar to the GT50 series from last year with smooth transitions and lots of depth to go along with rich coloration. A native 120Hz panel is included with the LA6200 and it does a sufficient job of reducing blur in fast motion images. This is usually a notoriously negative area of picture performance for LED-LCD TVs, viewing images from side angles on the LA6200 is very impressive. The clear screen does allow for some glossy reflection but does a nice job from side angles even though there is still no comparison with plasma TVs. 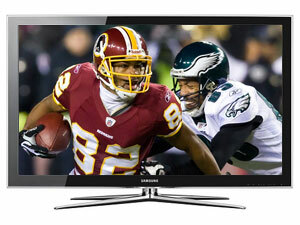 The Samsung PN60F8500 is an incredible new Plasma offering from Samsung and marks a significant departure from 2012 top line models of plasma that seemed like an afterthought to the enlarged LED TV lineup. Samsung deems the panel for this TV the Super Contrast Panel and this is the only plasma in Samsung's lineup for 2013 to contain this panel. This is Samsung's top of the line for 2012, the 60 inch UN60ES8000. Lots of new features abound and include a cool new remote which includes a QWERTY keyboard and (so far) Google's new TV search function. 3D viewing is awesome with a smooth, vibrant picture void of any problems from past years - no flicker from the glasses, no crosstalk, no blurring etc. The TC-P60ST50 has the Infinite Black Pro panel which the VT series had in 2011 with a cell structure that increases black levels by 1.5 times. The 60ST50 does not prevent glare as well as the VT50 but does a nice job. This is a fantastic panel and picture quality for such a value oriented and well price active 3D plasma. At around $2599 it's not going to be your least expensive solution but the LG 55LM8600 has a feature packed offering. This is a faster Hz rate used in the 55LM8600 to attempt to eliminate motion artifacts caused by fast moving objects across the screen. It increases the normal 60Hz rate to 240Hz. We see the jump to 120Hz as the most significant, but the worth of this feature really depends on how the TV processes the signal when using it. This will help sports programming though and we did not note any motion lag when viewing this TV. For sheer size, the 80" LC-80LE844U will display sports in a huge way. While again this is not an inexpensive selection at $5000+ it is the largest LED TV currently available. It will not be the finest picture due to the 1080p resolution in such a large screen size, but it does have Sharp's Quattron technology, fast 240Hz response rate, and active 3D viewing. Viewing angles are not as strong as plasma nor the LG listed above. At $1899 this is an attractive value play from Toshiba while still delivering very good quality and a new updated appearance - Aero design. Toshiba's 55" edge lit 55L6200U has a good bit of judder effects when panning side to side or during fast motion. We recommend leaving the 120Hz anti-judder feature on for this TV as it does not produce too much "soap opera" effect when left on as many other televisions do. The KDL-46HX750 46" size LED offers Fluidity in the picture during fast action (read sports, football) or camera panning is the objective of the Motionflow XR 480 feature. The 480 specification is to alert you to the fact that the backlight is helping to make the native 240Hz panel process faster. Results are usually quite mixed on these features with fast action sports looking great and movies and other film based material having some complications. The 60" Samsung PN60E8000 has built in advantages for sports programming such as perfect side viewing angles and no problem with judder in fast moving image. Realism and richly non-oversaturated color at exceptional on the PN60E8000. The new All Black Pure Filter the E8000 continues that. Colors on the PN60E8000 look like you would expect them to if you saw them off the screen. At $2000 for a top tier 60" TV it's not bad on the wallet either though we do recommend it for darker rooms. Another good 55" choice, the TC-P55GT50 has those natural plasma technology advantages for sport programming of off center viewing and smooth motion. The new 2500 focus field drive increases processing speed even more. At $1899 it will not kill the budget. Color richness and saturation after calibration is also excellent. We make them pop with our settings. For price consideration LG has provided a couple of compelling models such as this 60" unit priced at under $1500. The PM6700 has a new black filter that increases contrast and black level over previous models. Improved black levels and contrast also mean improved color performance and detail in dark and low lit scenes. For the 32" size we've chosen the 1080p LG 32CS560 which sells for around $350. It will be a good, solid performer in this smaller category.